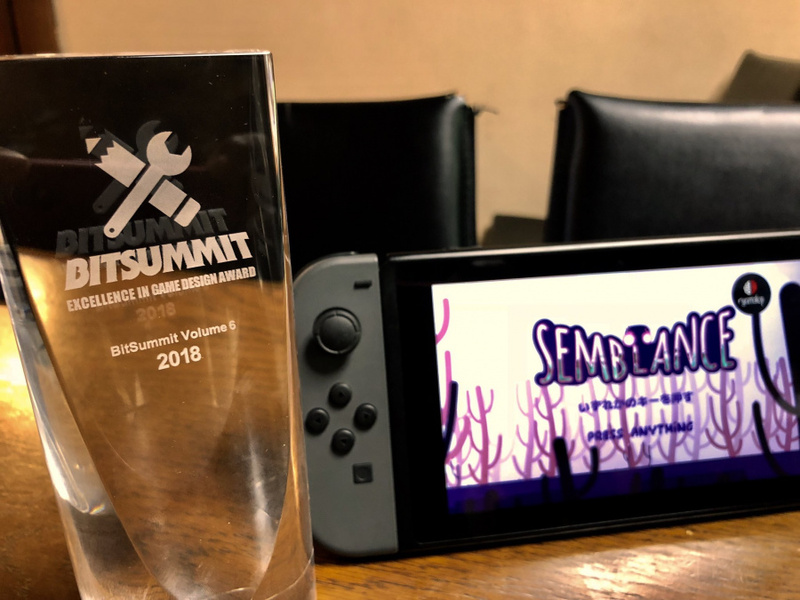 At Kyoto's Bitsummit indie games festival, we had the chance to have some hands-on time and chat to the developers of ‘playdough’ platform puzzle game Semblance, from South African developer Nyamakop. The demo was all about the realisation of what was possible from one puzzle to the next, as the world and various platforms are altered and other elements are positioned to collect orbs and traverse the beautiful landscape. As we learned new moves and encountered new hazards, there was a continual sense of discovery and learning from our mistakes, as even when we thought we had solved a particular puzzle, there were still more traditional platforming and obstacles to pass. The game really started to show its stuff later on in the demo, as we talked to programmer Cukia 'Sugar' Kimani about how different sections have more than one solution and the use of momentum impacts how you slide, jump, dash and stoop to your goal with satisfying fluidity. Orbs that are agonisingly (or sometimes impossibly) out of reach become accessible by nudging both vertical and horizontal areas of the world into place. Trees sway, dust floats and hazards glow, bringing the vivid and layered world to life. 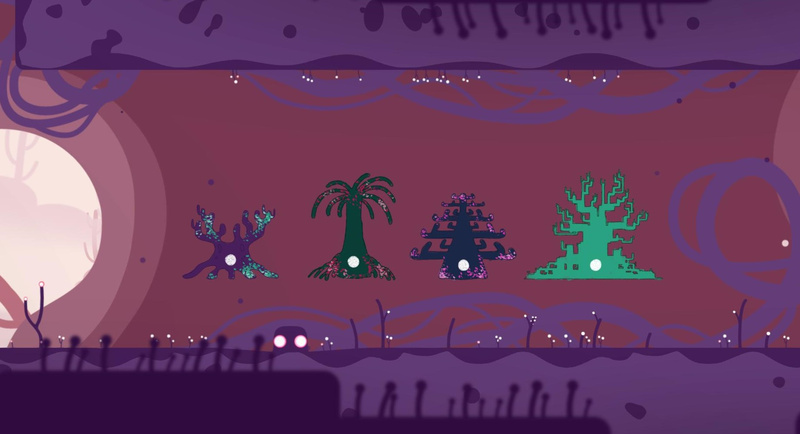 We enjoyed our time with Semblance a lot, and once we’d solved the last puzzle, "in a different way to most others," we spoke to both Sugar and designer Ben Myers about the game. Nintendo Life: First of all, you won the award for excellence in design at BitSummit. Congratulations! Ben Myers: Yes, thank you so much! It’s a wild feeling, to be honest - everyone is hyped about Boyfriend Dungeon, so to beat them in the design category is surreal. We formed this studio right out of our game design course in South Africa, so to be competing, and sometimes beating, world class game designers for an award like this is crazed. As Sugar always says, "We’re just a couple kids from Africa, just out of university." NL: The colour scheme is pretty striking. What was the approach regarding the aesthetic of the environment? What other locales will be explored? Ben: We actually spent a long time designing the color palette - we specifically designed it to stand out. We looked at what color palettes people were using (on Steam, at the time), and decided one with pinks/ purples would stand out the most, and it’s definitely worked. When you see Semblance in a sea of screenshots, it pops. The approach actually has an interesting story. 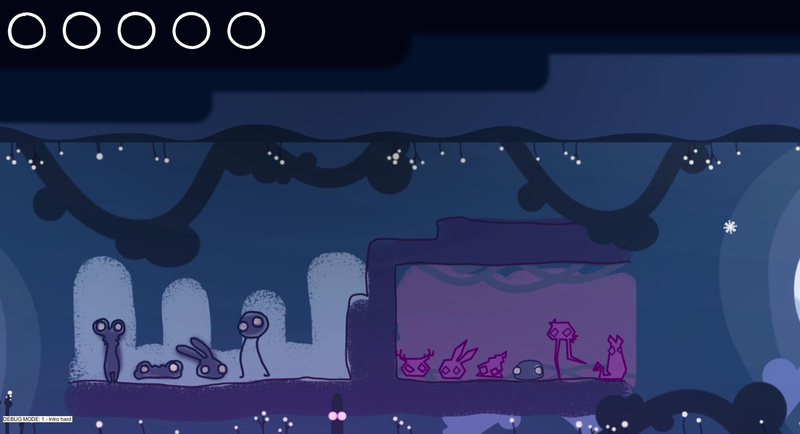 Sugar, the programmer, started the game’s life as being inside an abstract painting (Rothko, etc. ), where you could change the character’s shape to change the painting too, so the entire game has a background in abstract/minimalist art. As we were just two programmers without an artist, we invested a lot of time in high-grade programmer art: using tweening, springing, and lots of code hacks to make the game feel alive and visually interesting. When we started collaborating with artists, a lot of the juicy code we’d made would have been too difficult to apply textures and sprites too, so we decided to stick with a minimalist aesthetic. All the platforms, and the character, are all rendered, shaped, and animated with code! We also find this art direction makes the game quite internationally accessible - we’ve exhibited in America, Europe, Africa and Asia, and the response to the art style is always really positive. There are three worlds in the game, each with its own major mechanic addition, plus a distinct color palette and setting. World One is pink, World Two is green and swampy, and World Three is white/blue in the snow. NL: Is there a story told? Ben: Yes there is, but we use no text in the telling of it, though. As it’s a puzzle game, we wanted to make a mysterious story that the player has to piece together as well. Throughout the game, there are cave paintings that allude to the plot of the game. The basic setting is: the property of ‘hardness’ doesn’t usually exist in this world - everything is soft, squishy, and bouncy. Yet, this infection of hard crystalline material has begun to seep into the world and infect everything, including the adorable critters. You’re a piece of the ground that has been brought to life to bring the world back to softness. Ben: Yes. The character is actually procedurally animated and rendered! The programmer used bezier curves to shape the character, and then there are springs on the body for moving the character into new positions. That’s what makes the character feel so jiggly. We felt it was important to make the character feel jiggly/fluid for a lot of reasons: it makes the character a joy to control and interact with, but also really makes it feel like it’s a piece of the squishy ground that’s been brought to life. Plus, because you can change the shape of the character too, it was important to have tech that could support that. NL: So each puzzle is a single screen? Ben: Yes. Every element required to solve a puzzle is on screen, and all elements on the screen are critical for the puzzle. We designed it this way so players would intuitively understand that everything they need to solve a puzzle is right in front of them, and they don’t need to worry about thinking the solution is somewhere off-screen. This is a device we use to focus players - if you know everything is on screen you boundaries of a solution are clear. This also gives you an out - you know the solution is there, but if you can’t figure it out then you can just come back later. NL: It goes against the convention that platforms are a means of getting from A to B and aren't manipulated, so this turns the notion of platforming into a puzzle game. Ben: Yeah and what’s interesting is that platform deformation actually came from a glitch. We were originally making a game where you could just change the shape of the character. We were experimenting with creating a soft world that this squishy character inhabited, but had this issue where every time you touched the ground, it would lower a bit. The programmer tweeted it, and people said, “wow that’s cool actually,” so we decided to make it the whole game. We tried to be very aware of ‘finding the fun’ in unexpected places while making Semblance. 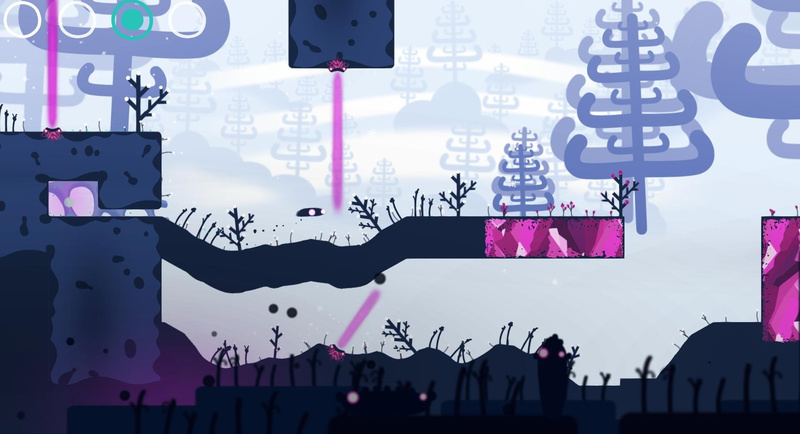 We’ve been jokingly calling Semblance ‘the first real platformer’ because it’s technically the first game where platforming is actually the verb, because no other game allows you to deform, shape, and morph the platforms. We call it a ‘shooter’ because you shoot in it, surely a ‘platformer’ should be where you use platforms? Just a silly linguistic thing we play on. NL: How much freedom is there to solve a puzzle? Ben: Many of the puzzles have multiple solutions to them - this is kinda just accidental from how much freedom the platform deformation gives you. Because of how the deformations work, many puzzles have several slightly varying solutions, as well as major alternate solutions. As a result, we often refer to puzzles having solution ‘ranges’ rather that single solutions. In playtesting, we often see players figure out alternate solutions we hadn’t even thought of, and if that stays in the general ‘solution range’, we leave it in. 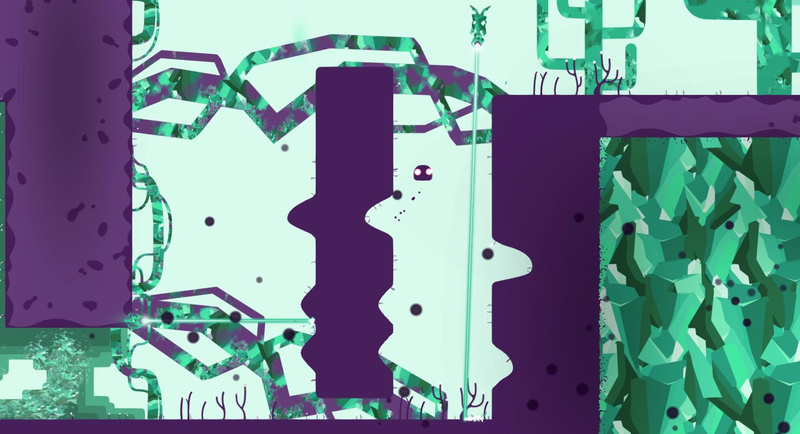 One writer described Semblance as ‘collaborating with the designer’ to make levels, which we really like, because you can sort of shape platforms to make executing a puzzle easier or harder for yourself, as you wish. It’s akin to an innate accessibility. We’re excited to see speedrunners play around with these slightly varying solutions. NL: We liked the idea of using both the character to change a platform as well as the reset beams that add a Portal-like sense of using momentum. How has that evolved during development and explored throughout the game? Ben: Designing systems is akin to having a huge mass of LEGO pieces and you’re trying to build a Death Star model. You start out with the wrong pieces in the wrong order until you finally figuring out a small piece that looks right, and run with that. Initially all beams did were interact with the player, they didn’t affect platforms, and didn’t move with them. We had this script to anchor flowers to platforms when they deformed, but for some reason had never thought to apply it to level elements, so one day we just threw the script on there and tweeted a little puzzle idea and it got a few hundred RT’s, so again, we decided to investigate that more. After that insight, it clicked into place to make the beams affect platforms, and also anchor to them. They still affect the character too! So through discovering that interaction we unearthed this huge mass of gameplay that is interesting. The reset beams are actually the core sub-mechanic of the second world, there’s just that much interesting stuff there. There’s good stuff there - but we don’t want to spoil too much! NL: How have you balanced the freedom of changing the environment with guiding the player sufficiently, especially considering the puzzle aspect of the game? Ben: It’s been a tricky balance to strike! It’s a game that asks players to think very laterally - you have these assumptions that come with a genre, that we ask player to break and think of in new ways. Thinking of the platforms themselves as ways to solve the puzzles is a really fresh and weird way to interact with a game, so we spent a long time making sure the structure of that understanding was near perfect. The core design mantra is based on Raph Koster’s ‘A theory of fun’, basically the idea that the feeling of fun is just learning happening in the brain. Based on that, the whole game is basically a tutorial, similar to what people talk about with Portal. But it’s not like we have invasive text telling players what to do, we have three controls prompts in the first five minutes of the game, and the rest of what we mean by ‘tutorial’ is level design. Each puzzle is teaching a small piece of the mechanics, an interesting interaction, and then in more challenging puzzles (which there are), we ask the player to make the next conceptual leap themselves. For example, here are two concepts: platforms can deform, and platforms reset when they touch a beam. Then we ask players to experiment with what happens if their character is on a platform when the platform touches a beam, which results in a trampoline mechanic. The difficulty in the game is mostly conceptual - harder puzzles ask players to take bigger conceptual leaps, rather than physically bigger jumps. So we give players a lot of room to experiment and figure stuff out, but we’ve also designed every single puzzle to either intuitively teach players something or challenge them to figure out the interaction path we’ve set up. In terms of balancing the freedom with guiding players, we design some puzzles sometimes to not allow you to deform all platforms in a puzzle, just so we can guide them in the right direction. At the same time, these ‘hard platforms’ enable players to change their character’s shape too, so it’s not like we’re restricting players utterly - we’re restricting one aspect, while building on another one. NL: How has player reaction and feedback been? Ben: It’s been amazing! We’ve been showing, structurally, the same demo for about a year, but the reaction has increased every show with all the polish and juice we’ve added. What’s so exciting is the different angles people enjoy the game from: people love the art or the cute characters; puzzle fans love the unique mechanic and the way the puzzles are constructed; and kids really enjoy interacting with it too because of the accessible controls. At PAX East we even had a boy teach his grandmother how to play - the first game she’s ever played! NL: Has it affected the game or its development in any way? Also, because indie game development is so risky, you really need to be getting a good response from players at shows to provide evidence that the game could do well - that people actually want this thing you’re making. I would say 75% or so of people at shows finish the whole demo, which is a great sign to us. Not to mention the significant morale boost response like this can give the team. NL: How does the full game expand on ideas in the demo (which was really good at introducing the world and mechanics, bit leaving enough open to look forward to the full game)? Ben: There are tons of neat little interactions and mechanics that aren’t in the demo. In fact, many of the ideas that are in the demo go even a bit deeper than what you saw there. The system design of the game is specifically designed to have fewer level elements, while keeping the super deep ones. We had a bunch of interesting level elements that we cut just because they were a bit shallow, and weren’t interesting to build on after a couple interactions with them. So yeah, there are some cool level elements we left out of the demo to keep a nice conceptual learning ramp, but also the stuff that is in there goes a bit further than you saw. NL: There is a degree of linearity, but is also open, in terms of puzzle solving, is that right? Ben: Yeah, the game is kinda a mix between linear and open. We have these three worlds you can enter, and each world as an overworld where you can access each level separately, and then each level have a collection of puzzles inside. Of course, the puzzles in each level, and the levels themselves in the overworld, are all accessible from the start - you can play whichever level or puzzle you want. But because of the affordance of platformers of moving left to right, you usually just play the worlds, levels and puzzles in order. Because of that, we have designed conceptual ramps for players to go along, but skipping certain puzzles and levels won’t necessarily hurt you much, because we try isolate the conceptual ramps to levels. So we support a linear approach, but you can also access everything in an open manner, and we tried to support that as much as possible in terms of understanding the mechanics, and also because of avoiding frustration if you get stuck. NL: So it's possible to leave and come back to a puzzle, based on knowledge of the different mechanics? Ben: Yes that is totally possible, and something we specifically designed! We also don’t like puzzle games where if you get stuck with a puzzle, either you figure it out or you never play the game again. So we designed the game so that all puzzles in the game are accessible from the beginning. We only conceptually-gate players - and only in five or six places. So if you can figure out how a certain interaction works, you can get past that skill gate, and play all the puzzles there. We designed it this way so if you get stuck on a puzzle, you can move on and come back to it whenever you like. We definitely have an ideal linear order for solving the puzzles, but learning and understanding don’t always work that way - you have this huge messy model of understanding in your head, and different things click for different people at varying times. So we allow people to move on, and maybe something they do in another puzzle will make it clear how to solve the puzzle(s) they have left behind. NL: Is there an inclusion or balance between more twitch-based action platform elements like Super Meat Boy, or what have you embraced or tried to avoid considering the freeform nature of the game? Ben: We have tried to avoid too much twitch-based gameplay. One of our mantras was ‘conceptually difficult, easy to execute’. We want players to be challenged conceptually with a problem, but once they figure out they correct solution, they can execute it reasonably enough. However, due to the genre of the game, you still have some execution difficulty in there for sure. We also have secrets, and collectibles, that require a bit more twitch-based gameplay to get to. I think speedrunners will really be the ones who lean on the twitch-based controls - they’ll try to use as little deforming as possible to save time to complete puzzles. Again, we’re happy with this direction because it means the game has a low skill floor, but also has a reasonably high skill ceiling, so you can engage a wide variety of players. We’ve had a couple of speedrunners come hog a station at shows and just sit there breaking the game, and figuring out things - it was amazing to watch. NL: Any use of the specific Switch hardware features? Ben: It took us a while to get our dev kit, so we didn’t have as much time to experiment with the awesome features the Switch has, like the HD Rumble. Yet, we think the game still works really well for the platform, because the level and world structure of the game is designed in a way to enable players to leave and come back to puzzles later - this works excellently for the portable nature of the Switch. NL: Any hopes for a physical release or other media? Ben: We definitely hope for this to happen! If the game sells well enough we would love to look into a physical release, and maybe even a vinyl OST. All a dream until the game does decently, though! NL: When can we expect to see the full game? Ben: It'll be out in 2018 - we'll be announcing the launch date very soon, but can't quite say when yet. I'm not much on indie games, I probably ignore 75% of them, but this one looks really interesting. Definitely on my radar. Anything clay/paper/handmade themed gets a thumbs up from me. It's like a more puzzly variant of The End Is Nigh. Looks neat. Probably won’t be too expensive. I’m sure I’ll end up getting it if it isn’t. @rjejr hope you give it a play at some point - sure it will intrigue you! @Paraka We've been working on this since before The End is Nigh was even a thing! It's very different to it in terms of gameplay, colors, and music. Only similarity is the blobby character . Comparisons to The End is Nigh is definitely not a bad thing though! @Nyamakop Hey guys! Not sure if you're hanging around on here since your game makes its big debut tomorrow but I just wanted to say that I'm SUPER stoked to dig into your game tomorrow (got my $10 ready to roll on the eShop!) and the more I've read your perspectives on the game the more excited I've gotten about it. Not to tread on the comparison ground too much, but I was pretty hype on The End Is Nigh but that turned out to be a form of torture masquerading as a video game lol. Semblance on the other hand, was made to be inclusive, was made to be FUN, and the whole premise of making the world "soft" again hides what I suspect is a broader message to the world at large that is much needed right now. Just wanted to thank you guys for doing something from the perspective of pure joy, it is rare and I always like to recognize it when I see it. 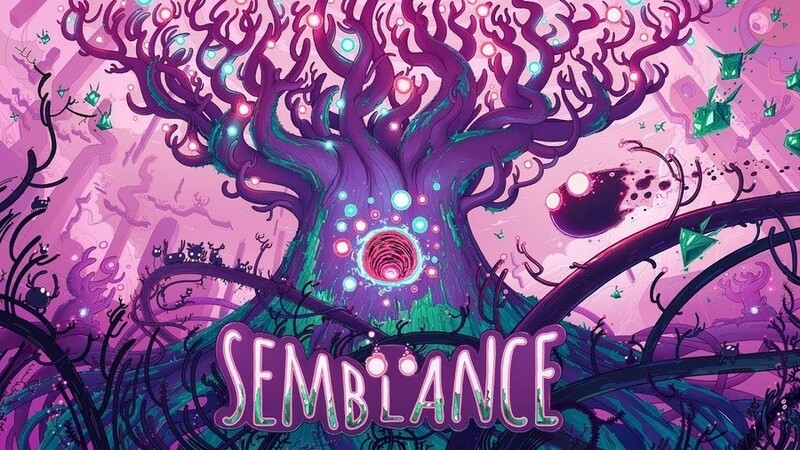 Cant wait to play Semblance and I'm looking forward to more from you guys! @Fake-E-Lee we're always watching and reading the comments! @Nyamakop No thanks necessary, I think this game is going to be absolutely amazing and it has its perfect home on the Switch. I wish you guys the absolute best and congrats on what I think will be a very successful launch! @Nyamakop Fantastic game guys, what I've played so far is amazing and I can't wait to get home and dive in even more! Seriously, awesome stuff!